Life of Purpose is the first primary care treatment center on a college campus in the U.S. Learn more about our academically-focused addiction treatment options. Florida drug and alcohol rehab center Life of Purpose Treatment provides three courses of action parents can take when they find out their kid is using drugs. Boca Raton, FL / December 18, 2018 / -- Florida addiction rehab center, Life of Purpose, offers parents advice on what to do if they discover that their teen is using drugs. Alcohol poisoning – If you suspect that your child has alcohol poisoning, it’s crucial that you seek medical help immediately. Intoxication with opiates – If your kid is using heroin or opioid painkillers, it should be considered an emergency situation. Agitation due to cocaine, meth, or other stimulants – If your child is extremely agitated, seek help right away. If your child is unconscious or seriously impaired by any of the above substances, you need to call an ambulance or get your child to a hospital as soon as possible. It is better to err on the side of caution, as drug overdose and withdrawal can sometimes cause death. If you determine that it is not an emergency, or after the emergency passes, it’s important that you assess your own feelings about your child’s drug use. Just as you have to put on your own oxygen mask first in an airplane emergency, you need to take care of yourself before you attempt to deal with your child. In order to help your child, you need to be calm and logical. That means that if you cannot see the situation clearly because you are angry, anxious, or afraid, then you need to enlist someone else to take responsibility – a trusted friend, family member or addiction specialist. Stepping back for the moment and reengaging when you have become calm doesn’t mean that you don’t care, and it will benefit you and your child in the end. 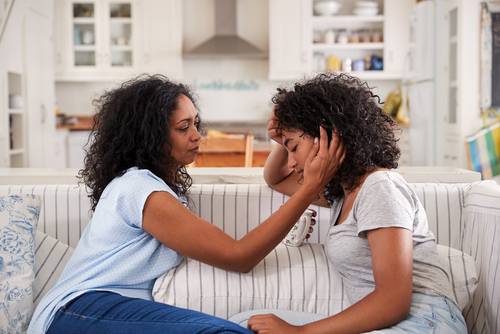 Once the initial crisis is over and you have your emotions under control, then you must encourage your son or daughter to get treatment for his or her drug use. Do not bury your head in the sand or think that this is a phase your child will get over. Remember, thinking that a teenager has to “hit rock bottom” before they will benefit from treatment is absolutely false. Many kids who used drugs have had the “bottom” raised by parents who got them into drug or alcohol addiction treatment. If you or a family member is suffering from addiction, Life of Purpose can help. We offer treatment programs in Florida and Pennsylvania. Please contact us today at 1-561-614-8232 for more information about how to get help.